After a disappointing first half to the new series of Doctor Who, and a "farewell to Amy and Rory" that seemed to be happening every week, their actual final episode turned out to be worth waiting for. 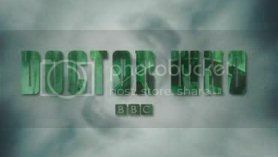 This week the logo has Statue of Liberty verdigris to signal a New York episode. Noir is the rather unlikely choice to end this mini-series' journey through a variety of blockbuster genres. "The Angels Take Manhattan" does somewhat weaken the impact of the Weeping Angels even further - they've never been as scary as in "Blink," and here people seem to be taking their eyes off them all the time, with no negative results - and Mike McShane's mob boss Grayle is another of those characters who could have been interesting but ended up being just a plot device. But apart from that it was mostly positive, and unlike the rest of the series so far, enjoyable enough on a second viewing too. Having fudged the buildup to the Ponds' exit, their actual departure was handled well, with the right amount of sentiment not tipping over into schmaltz. It seems right that River Song should have been there for their last episode, and her presence helps Steven Moffat use his trademark "timey wimey" in an interesting way, with clues being left in a self-published book and ancient pottery, and the resolution hinging on a paradox that explains why the companions have to be left behind, rather than the plot shortcut it's occasionally become. Some nice little callbacks to the Ponds' time on the TARDIS, especially the whole resolution being based around Rory killing himself because, after all, he keeps coming back from that sort of thing. And though mostly going for the emotional impact, there's some nice gags as well - I liked the implication that Amy and Rory actually have needed to hire a babysitter for the Doctor in the past.